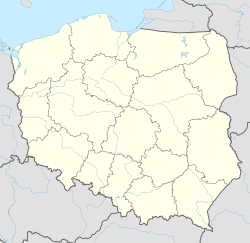 The village of Dukla was first mentioned in documents from 1336. At that time, it was a private hands, belonging to the Suchywilk family. In 1373, Dukla received Magdeburg rights charter, and the town was part of Kraków Voivodeship. Dukla belonged to several noble families, such as the Cikowski, Ossoliński, Potocki, and Stadnicki. In 1474, the town was destroyed in a raid of Hungarian army of King Matthias Corvinus. In 1540, Dukla was purchased by Jan Jordan of Zakliczyn (Trąby coat of arms). The new owner expanded the Dukla Castle, and received from King Sigismund I the Old a privilege, allowing him to organize two fairs a year. Dukla remained in the hands of the Jordan family until 1600, and in 1595, King Sigismund III established here a customs office. In 1601, the town was sold to Andrzej Męciński, who died in the Polish–Muscovite War (1605–1618). In 1636, Dukla was sold to Franciszek Bernard Mniszech, the brother of Tsaritsa of All Russia, Marina Mniszech.